Jesse Campbell on Amsterdam II, or Otto, were second in the CC103*at last weekend’s FEI Eventing Nations Cup at the Houghton Hall international Horse Trials in the UK. ESNZ’s High Performance Administrator Jacky Green spills the beans on what Otto is like behind the scenes. Amsterdam (Otto) came from Germany as a young horse and when he arrived we all thought he was a 2 year old! 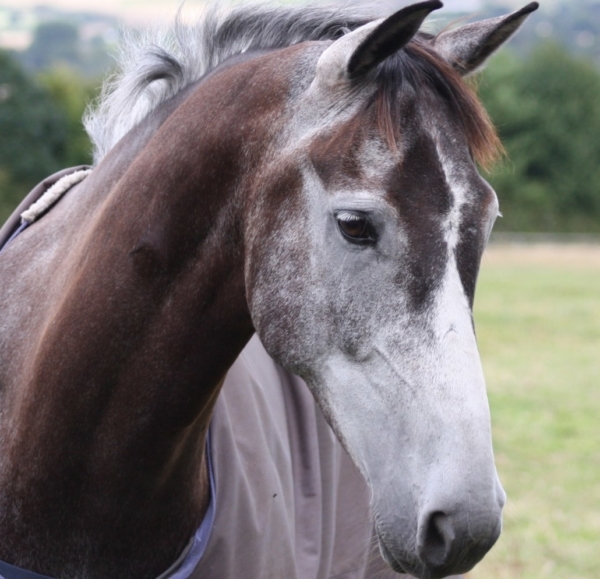 He was all legs and skinny body but he was also beautiful with a striking dapple grey coat and a white mane and tail …. every little girl’s dream pony. Except Otto is very much a boy’s horse these days. He has his quirks which he mostly hides under the appearance of worldly charm but every now and again they arise unbidden and catch people out. The nice man checking the ear bonnets and bits at Houghton after the dressage strolled up to Otto as he was accepting praises from those around him and as soon as he touched him, Otto reacted as though he had had an electric shock! Otto is all business -like at a competition but at home you can’t get him down the road if the bins are out and it’s a full moon week. He will not tolerate his legs being bandaged but he doesn’t mind the icetight (leg clay). He adores his girls and likes nothing more than to be turned out with his favourite mare. He has lovely manners and is not impressed with his stable mate Cleveland (Freddie) who can’t but help but be a bit of a thug at best. He also loves going out for his winter holiday but turns pretty feral after the first week and pretends he has never seen a white man before ( unless they come bearing food in which case he makes an exception). He is a pretty cool dude all round and he and Jesse have a fabulous partnership as he has never evented with anyone else riding him. Luhmühlen Horse Trials 4 star in Germany is the next competition…. Otto will be going home!